Provides core interface functions like switching windows, launching applications or see your notifications. It takes advantage of the capabilities of modern graphics hardware and introduces innovative user interface concepts to provide a delightful and easy to use experience. 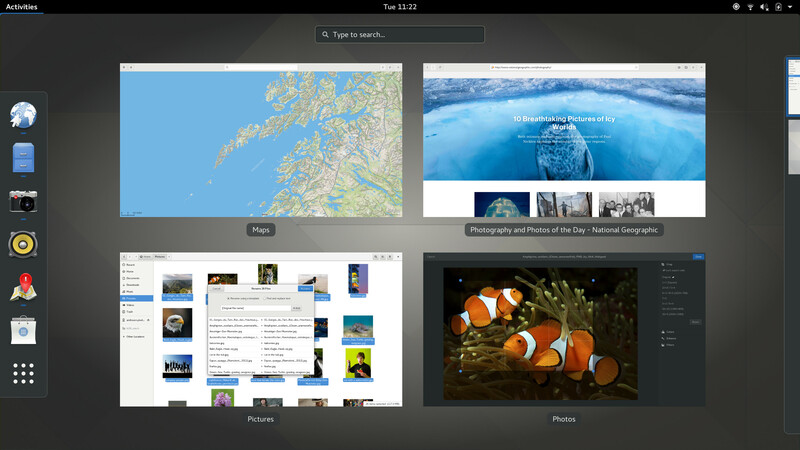 GNOME Shell is the defining technology of the GNOME 3 user experience. IRC: Join irc.gnome.org:#gnome-shell to participate in daily discussions or get help with running, developing, or designing for the GNOME Shell. Mailing List: Subscribe to the GNOME Shell mailing list to get updates about the latest features and participate in the development and design discussions. Feel free to use this list for mailing your design ideas to it. Bugzilla: Monitor "gnome-shell" product in GNOME Bugzilla and use it to submit bugs or feature requests. View all open bugs. You can add gnome-shell-maint@gnome.bugs to your "Users to watch" list in your email preferences for GNOME Bugzilla to get e-mail updates about changes. Commit Updates: Subscribe to the gnome-shell module code updates in your commits-list subscription options. Commit log for the GNOME Shell can be viewed here. Cheat sheet - guidance for getting started with the shell, including tips and tricks. The main GNOME newcomers guide is useful for anyone wanting to contribute to GNOME. The tutorial on building GNOME with Jhbuild contains information on how to build GNOME Shell. Technology - information on the technologies used in the shell. Also covers architecture. See the extensions page for information on developing extensions. We also need help to review extensions! GNOME Shell project takes a highly considered and open approach to design. Designers are involved in every stage of the development process from start to finish. The design process is not a hit and run - slap it on in the end affair. Original shell design page - contains historical material which may be of interest. Current design pages - these OS design pages provide up to date design information on each aspect of the shell. Design team - for information on getting involved.